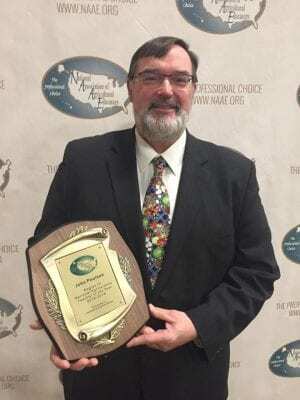 A longtime teacher at Pettisville High School has been recognized as one of the top six Agriscience Teachers of the Year. “I am proud to have won the award and humbled because of the number of good students in peers it has taken me to get to this point in my career,” Poulson said to The Village Reporter. The award recognizes teachers who have inspired and enlightened their students through engaging and interactive lessons in the science of agriculture. Poulson has been a teacher for 34 years, the last 27 at Pettisville. Students enrolled in agriscience courses at Pettisville learn a variety of topics related to agriculture, which Poulson calls ‘the original science.’ Topics of instruction in his classes include plant propagation, cellular systems in plants, hydroponics, the nitrogen cycle, how pH affects plants, and biodiesel production. The material is something that has kept his interest over the years. Due to the rigorous coursework in Poulson’s agriculture classes, students can earn science credit for taking them. Many of Poulson’s students also complete agricultural research projects with plants or animals and enter these projects in science fairs, including the FFA’s agriscience fair competition. For Poulson, reaching students through challenging coursework is a reward. Through his own growth in teaching the subject matter, he has changed the ways he brings the information to his students. What’s next for the Teacher of the Year? NAAE is the professional organization in the United States for agricultural educators. The NAAE headquarters are in Lexington, Ky.
© 2016 – 2018, James Pruitt. All rights reserved. Be the first to comment on "Pettisville Teacher Named Top Agriscience Teacher In Region"